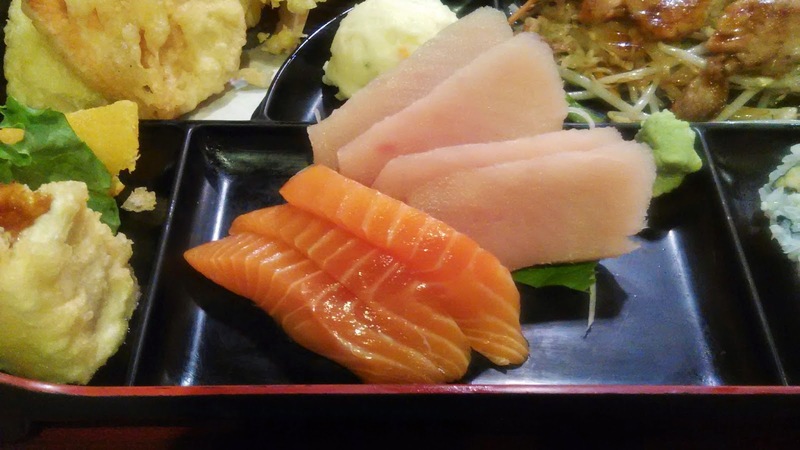 Perhaps the most well-known of the Japanese restaurants in Port Moody, Fuji Sushi is authentic and has had a successful past, gaining a substantial number of regulars. 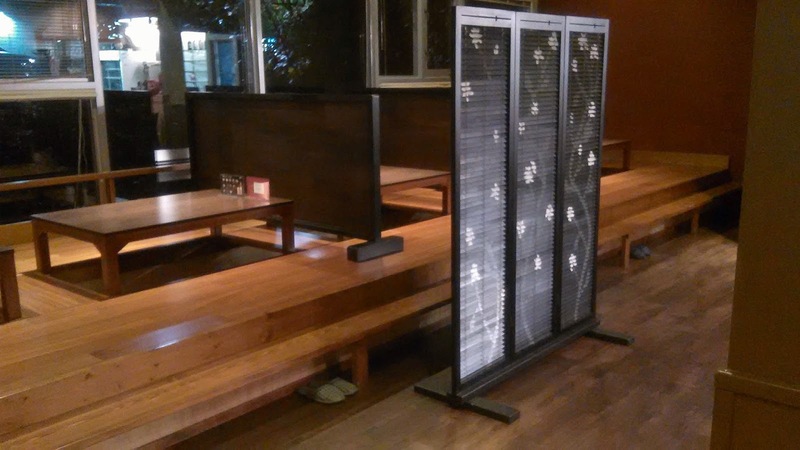 They recently undergone a renovation, which transformed the restaurant from having a light theme to a darker theme. I guess it looks more like a Japanese restaurant than before, but in my opinion, I found the lighter theme (from before) more inviting. In fact, I thought the restaurant was closed and still under renovation when I walked by until I saw the chefs inside. After the renovation, I also noticed that many of the prices had gone up. They also added a wide range of more expensive items to the menu, such as special rolls and aburi nigiri. 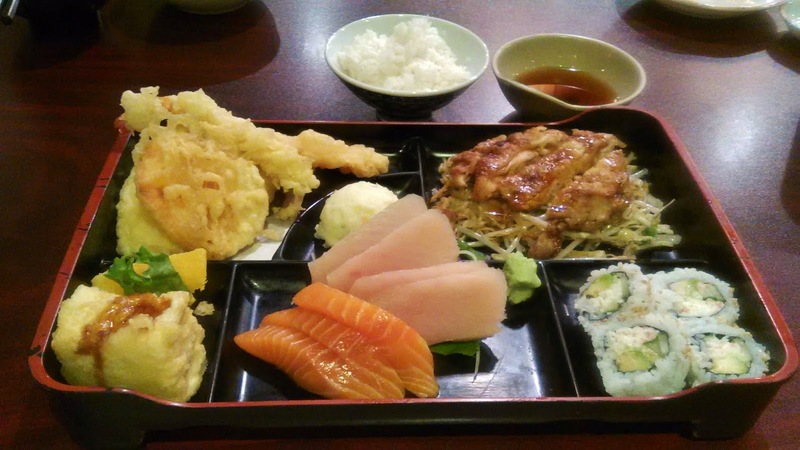 Wanting to sample a bit of everything and sticking with the basics, I decided to order to Sashimi Combination ($19.95), which contained Miso Soup, a salad, Agedashi Tofu, Tuna and Salmon Sashimi, California Roll, 5 pieces of tempura, a mashed potato appetizer and Chicken Teriyaki. 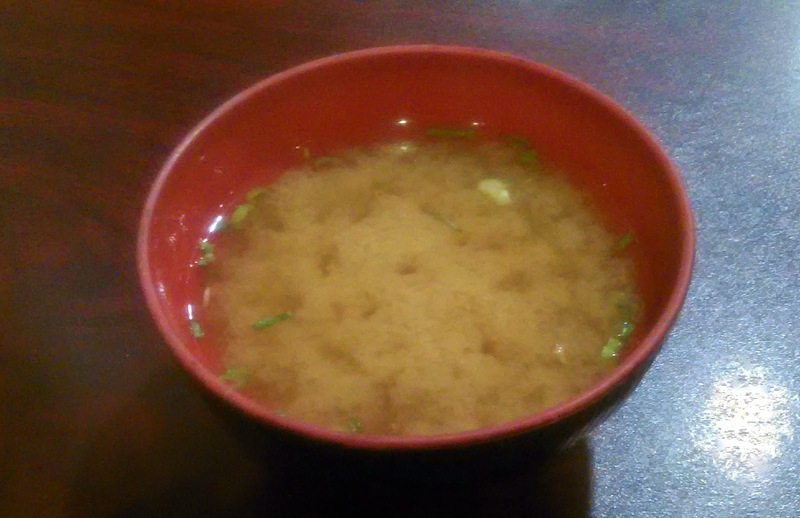 The Miso Soup was served hot and the miso paste was quite flavourful, but I found it a bit on the salty side. 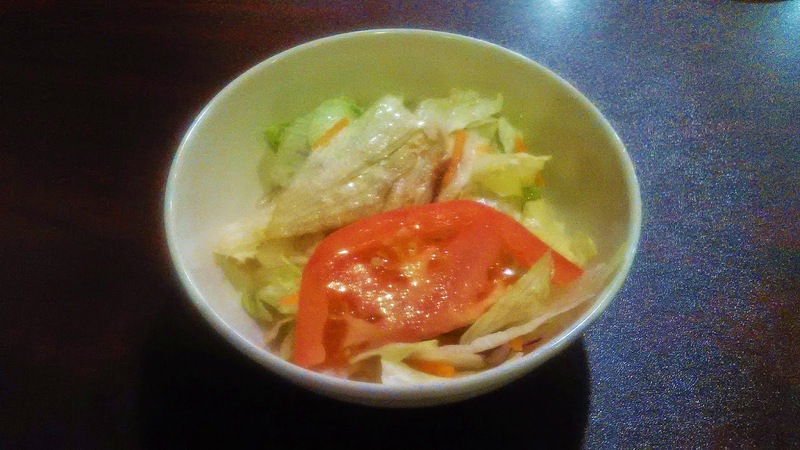 The salad contained fresh lettuce and tomato and the tangy vinegar-based dressing was a light, mostly liquidy vinaigrette. It may not look like it, but the combination is actually quite large and filling. 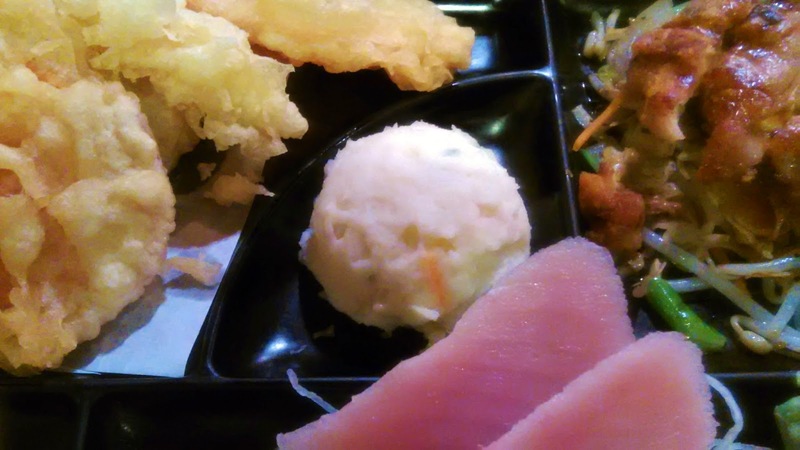 The Agedashi Tofu had light, crisp batter on the outside with a large piece of white tofu in the middle. I'm not sure if this was a good idea as the inside would have tasted much better if it was closer to the sauce. I prefer the smaller bite-sized pieces as those tend to be more savoury. It also could have used more sauce. The tuna sashimi had a bit of a sandy texture and was sliced quite thin, but it was adequately soft. It had a decent mild and balanced taste to it. The Salmon Sashimi was quite smooth and slippery (to the point that I had quite a bit of trouble picking it up with my chopsticks) and was a solid display of knife skills. However, it was quite lacking in taste, and was rather unwilling to absorb the soy sauce. 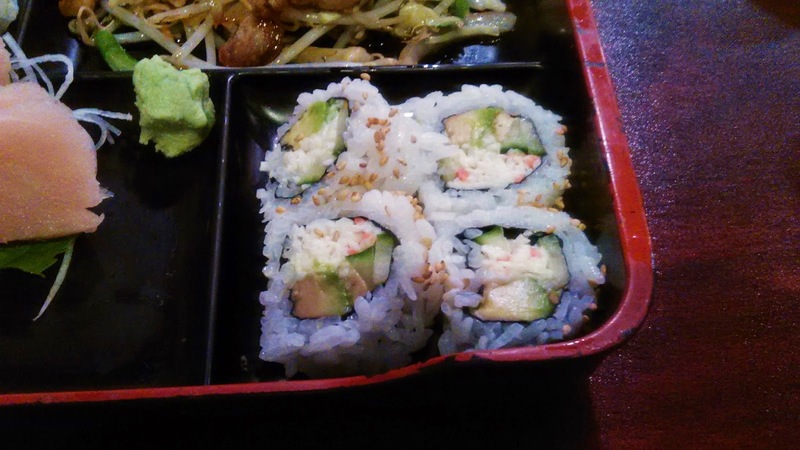 The California Roll contained relatively little crab and had a strong presence of avocado (which bordered on being overripe). The sushi rice was decent, but overall, I found the roll to be mushy due to the excess amount of avocado. The cucumber was also noticeably hard and could be cut into thinner pieces for better integration with the rest of the roll. As for the tempura, the batter was laid on very unevenly and a most of the batter had a soft bread-like texture instead of the desired light crispy texture. 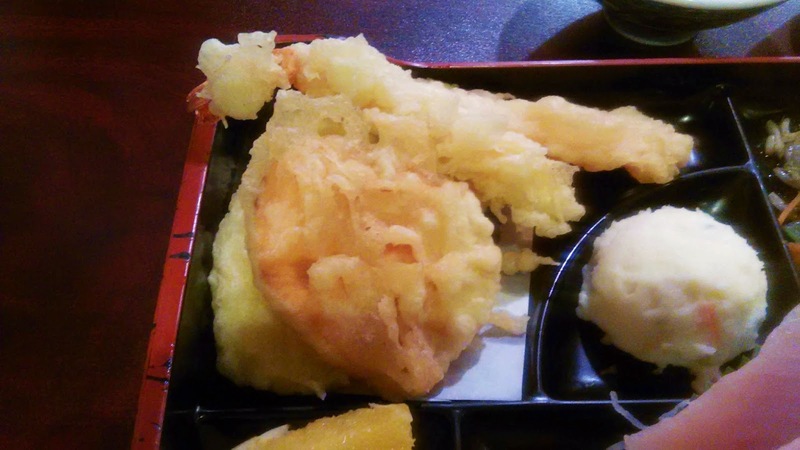 Perhaps they had an accident when preparing the tempura but decided that I would probably tolerate a minor slip. My favourite piece out of the tempura was the prawn, which was thick, meaty and tasty. 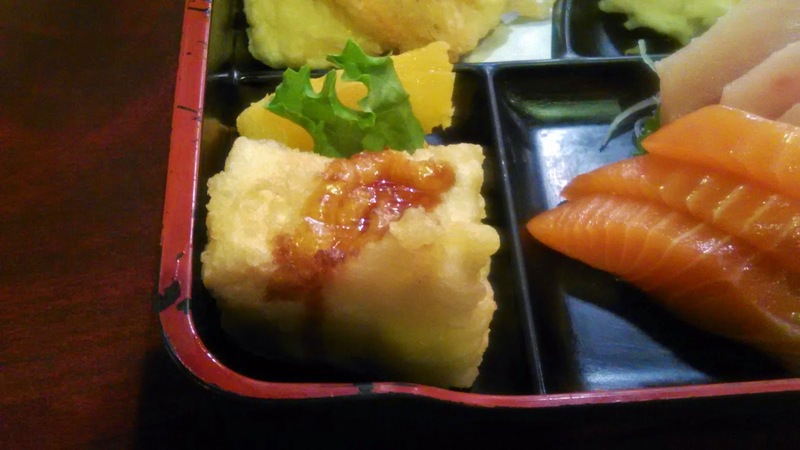 The Sweet Potato Tempura was cut to the right thickness and was soft, but the batter on this piece was hard in some places. The zucchini was thin and juicy while the carrot had a snappy texture. If the Onion Tempura was an attempt to mimic onion rings, then I must say it was a rather poor attempt. The slice of onion they used was huge and because of the soft batter, I felt like I was eating a large slice of unchopped onion. I failed to finish it. 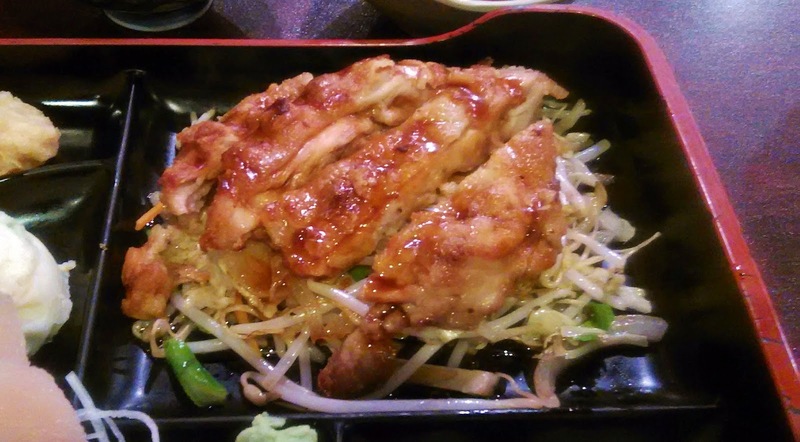 The Chicken Teriyaki was executed the best out of all the various items in the combination. The teriyaki sauce was delicious and brought out the flavours of the chicken quite well. They also did an excellent job of stir-frying the vegetables underneath. 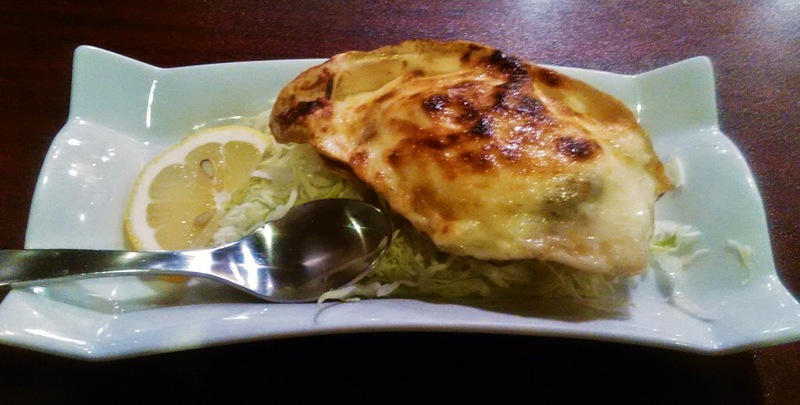 The Oyster Motoyaki was not part of the combination, but was one of the smaller items I could get without ending up too full (funny enough, this seems to be a common problem of mine). They were surprisingly generous with the amount of oysters in the motoyaki and the custard had a nice, creamy texture. The only issue was that the custard tasted excessively acidic (maybe the mayonnaise was too strong? or too much mayonnaise was used?). A bed of sliced onions lined the bottom of the motoyaki and the mild-tasting oil went well with the onions. The service was very friendly overall and the servers' bright attitudes clearly distinguished them from those at other restaurants. The food I received was a bit of a hit-and-miss game and despite the decent service, I don't think the price premium was justified. In fact, I remember the food as being substantially better before the renovation. The restaurant was mostly empty at prime dinner time on a Thursday night and I believe they would need to lower their prices or come up with a few first-class news-inspiring dishes if they wish to continue their past success. Unfortunately, Fuji restaurant is no longer a genuine Japanese restaurant. I used to go here and followed them from Burquitlam Plaza because it was one of the few remaining Sushi restaurants operated by Japanese chefs. The chef and waitressing staff used to be Japanese and the food under the previous ownership was much better. The current Fuji is Korean operated. Although there are some good Korean run Sushi restaurants (i.e. California Sushi in North Road and Sushi Garden in Metrotown), this is not one of them. I will not be coming here again, quite dissappointed by the quality of the food I had. Unfortunately, this is a trend of almost false advertising. They should have changed the name of the restuarant when the new owners took over. I suppose they bought the name from the prior Japansse owners. The same thing happened to Takarabune on Victoria Drive, when the prior Japanese owners sold out to the current Chinese operators. You can really tell the difference when sushi is prepared by a non Japanese. So, unfortunately, another Japanese run sushi restaurant is no more. Thanks for the update! It really was a shame that the food wasn't anywhere close to what it was before. It was also a surprise to see the prices go up by 30% after the takeover!